Feral ungulates such as pigs (Sus scrofa) represent a disturbance not present in pre-human Hawai‘i. Habitat-modifying weeds such as the alien melastome Miconia calvescens represent a major threat to native biodiversity. Bringing active threat abatement management to priority conservation areas isthe primary goal. The greatest, mostpervasive threats to the Hawaiian High Islands ecoregion portfolioare feral ungulates and invasive, habitat-modifying weeds. Threats such as fire, residential development,and military training are important and highly ranked at specific locations. The 1998 ecoregion plan identified and described the general suite of threats in theecoregion. ERA II builds on that foundation and ranks the highest priority threats foreach conservation area. Threats include some that are pervasive across all conservationareas in the archipelago and some that are specific to particular places (see table below). The key stress in vegetatedecological systems in Hawai‘i is change in comp­o­si­tion and structure,typically through sim­pli­fi­cation and loss of native diversity, followed byloss of understory (and eventually canopy) structure. The main sources ofstress include both biological and anthropogenic factors, discussed below. The continuing invasion of alien (non-native) weeds, predators, herbi­vores,patho­gens, and com­pet­i­tors into native eco­systems is the engine that currentlydrives the Hawaiian extinction crisis. Since the establishment offorest reserves encompassing nearly all re­maining native forests during thefirst three decades of the 20th century, alien invasion — not directhabitat de­struc­tion by humans—has been the domi­nant threat to native speciesand eco­systems in the Hawaiian Islands. 2) an exceptional range of hospitable habitats forinvaders to occupy. The estimated rate for suc­cess­ful,new colonization of the islands by a plant or animal species before humanarrival was once every 25,000 - 50,000 years. In contrast, over the past 30 years, newlyestablished species have been re­cord­ed in Hawai‘i at the rate of once every18 days. The existing com­ple­ment of es­tab­lished invasive aliens has the ca­pa­cityto overwhelm most remaining native habitat if left unchecked. 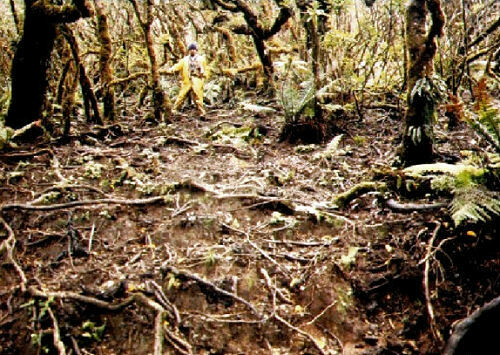 Understory obliteration by feral pigs in a montane wet forest community. o Ungulates – lacking any large native herbivorousmammals, the Hawaiian flora is not adapted to ungulate brows­ing or trampling.Feral pigs, goats, sheep, deer, and cattle were responsible for de­struc­tionof lowland ecosystems, and continue to degrade re­main­ing native ecological systems. o Invasive weeds – through a his­tory ofincreasing introduction of alien plants, there are now more species of nat­u­ral­izedalien vas­cular plants in the wilds of Hawai‘i than there are native species.Perhaps 200 of these are ex­treme­ly aggressive, habitat-modifying weeds. o Predators – small mammals such as rats, mongoose,and feral cats prey on native birds. Rats are im­pli­cated as wholesalevegetation modifiers via selective seed pre­da­tion. Predatory invertebratessuch as ants and other social hymenoptera have greatly disrupted in­ver­te­brate communities at allelevations, par­tic­ularly in the lowlands. For these reasons, conservationin Hawai‘i de­pends more than anything on keep­ing re­maining, rela­tivelyuninvaded native areas intact, stem­ming the es­tab­lish­ment of new in­va­sivespecies, and devising practical strategies to limit the impact ofwidely-established species. Asummary of threats across conservation areas in the Hawaiian ecoregionreveals that alien species such as ungulates and weedsare prominent and ubiquitous, with other threats active inspecific locations.Threat assessment followed Conservation AreaPlanning (CAP) guidelines. Abbreviations: Islands and ConservationAreas: KAU= Kaua‘i; WAI = Wai‘anae; KOO = Ko‘olau ; EMO = East Moloka‘i; WMA = West Maui;EMA = East Maui;KOH = Kohala; MK = Mauna Kea; WML = Windward Mauna Loa; K-K = Ka‘ū-Kapāpala; KON = Kona; P-P = Pōhakuloa - Pu‘u Wa‘awa‘a. Threat Ranks: VH = Very High, H = High, M = Medium, L = Low. Wildfirein Hawai'i is invariably followed by invasion by fire-adapted aliengrasses and shrubs, creating a cycle of destruction for native speciesand ecosystems. Mosquitos carry diseases such as avian malaria; deadly to endangered forest birds. Goats and sheep are a prevailing threat to drier native areasin Hawai‘i. Development remains a threat on O'ahu, where 80% of the state's population resides. Fire: Wildfire is an uncommon natural occurrence inHawai‘i, where ground-strike lightning is rare and wet plant communities coverlarge areas. Fire-adapted aliens(especially grasses and short-lived shrubs) are established inlower, leeward slopes and some subalpine areas. Normally ignited by people, these weeds fuel major wildfires that cancarry into native forests. Native forests are destroyed and replaced with fire-adaptedweeds in a trend that increases the range and intensity of these fires. Rodents are important egg predators in forest bird concentration areas. Small Mammals: There are no native small mammals (e.g.,rodents, cats, dogs, rabbits, mongooses) in Hawai‘i, andthe ecological effects of either herbivorous, omnivorous, or predatorysmall mammals is to reduce populations of native species, sometimes toextinction. 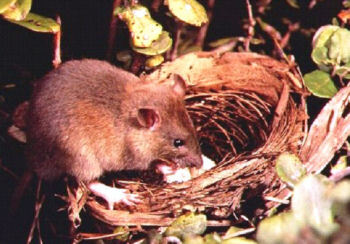 Rodents are implicated in damage to lowland forests viaseed predation, as well as on both ground-nesting seabirds and forestbirds. Feral cats and dogs impose similar impacts. Rodents seemparticularly damaging in the Wai'anae conservation area of O‘ahu,where they affect endangered tree snails, rare native plants, and anendangered forest bird, the ‘elepaio (Chasiempis sandwichensis gayi). Pathogens (including invertebrate pests):Diseases and pests can play an important role in reduction of viabilityof native species, and indirectly, the natural communities andecological systems comprised of these species. Pathogens and pestsrelated to declines in native species include mosquitoes andmosquito-borne diseases (avian malaria and pox), ants (various species), Erythrinagall wasp (Quadrastichus erythrinae), two-spotted leafhopper (Sophonia rufofascia), slugs (various species), andblack twig borer (Xylosandrus compactus). Often the role of pathogens is tied to otherthreats. For example, avian diseases affecting native forest birdconcentrations are spread by mosquitos, and spread of mosquitos intoforest bird habitat is tied to wallows of feral pigs that createmosquito breeding sites where none otherwise exist. Development :Widespread conversion and development of the lowlands of the Hawaiianecoregion took place from prehistoric times to the first half of thetwentieth century. Following statehood, strong conservation zoning haslargely limited development of natural areas and forest reserves, butincremental conversion of lowland native areas continues on the mostdensely populated island (O‘ahu), as well as the largest island(Hawai‘i), particularly in the Windward Mauna Loa and Konaconservation areas. Military training activities: Live-fire training, large-scale troopmovements, and heavy equipment operation are serious threats to native speciesat U.S. Army training facilities in the O‘ahu and Hawai‘i conservation areas. Training operations have resulted in clearingof native vegetation, increased wildfire, and the introduction and spread ofunwanted alien species. The Army hasinstituted an ecosystem management program to mitigate these impacts, and isnow among the state’s most active and well-funded stewards of native systems. Recreational use:Typical recreational uses of native ecosystems include hiking, camping,and off-road vehicle touring. Restrictions on damaging activities inthe state conservation district somewhat limits the impacts of recreational use,although indirect effects of recreational activities such as hiking, e.g., spread of invasive weeds, has been documented. Stream diversion: Nativestream communities are highly dependent on continuous stream flows to the seato support the diadromous life cycles of their dominant aquatic animals. Most of the state’s streams are alreadypartially or fully altered (channelized, diverted, or de-watered viagroundwater pumping), and those that remain are vulnerable as the demand forfresh water outstrips the current yield of harvesting. The new Hawai‘i State Water Code providesmechanisms for protecting stream flow, but these mechanisms await their firsttest cases. Overharvesting: Most minor forest and stream “commodities”(plant materials for lei making, flower arrangements, and herbal use; streamfishes and invertebrates for food) can be harvested for home and cultural use on asustainable basis. These activities arenot sustainable at a large, commercial scale in most situations, and arealready restricted by permit systems. Logging: Although logging andother high-intensity harvesting is no longer widespread in Hawai‘i (mostloggable areas were cleared in the last century), these and other clearingpractices are important concerns in some conservation areas on Hawai‘i Island. Commercial logging of native koa (Acaciakoa), ‘ōhi‘a (Metrosideros spp. ),sandalwood (Santalum spp. ), and hāpu‘utree ferns (Cibotium spp.) areapproaching the limits of available resources, and the forest products industrysupports planting programs to restore former forest lands. Grazing: Clearing of forest for production of cattle has a 200 yearhistory in Hawai‘i. Cattle, being large ungulates, have the samedamaging effects on native vegetation as other ungulates,and the devastating effects of cattle in Hawai'i have been welldocumented. 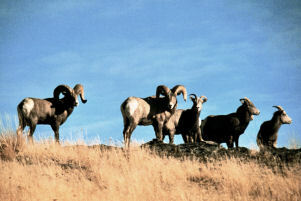 Today, there remain large private ranches, several ofwhich occur within native ecological systems. Ranching-relatedloss of native ecosystems is active in the Kona conservation area inparticular.